Transporter 5™ is a premium ready-to-use transfection reagent prepared from our popular linear polyethylenimine MAX (PEI MAX 1 mg/mL). Transporter 5™ effectively transfects mammalian and insect cells, especially HEK-293, CHO, and Sf9. We understand every transfection is a major investment, so we designed Transporter 5™ to be a reliable reagent in any process. The quality of Transporter 5™ begins with our production process. Our special production method for PEI creates pure polymer with no batch-to-batch molecular weight variation. Transporter 5™ combines our consistent PEI with the highest quality USP/NF reagents in sterile, single-use equipment. While standard methods use 0.2µm sterile-filters, we use 0.1µm to completely eliminate mycoplasma risk. Our Quality Control ensures Transporter 5™ is the most reliable reagent available. 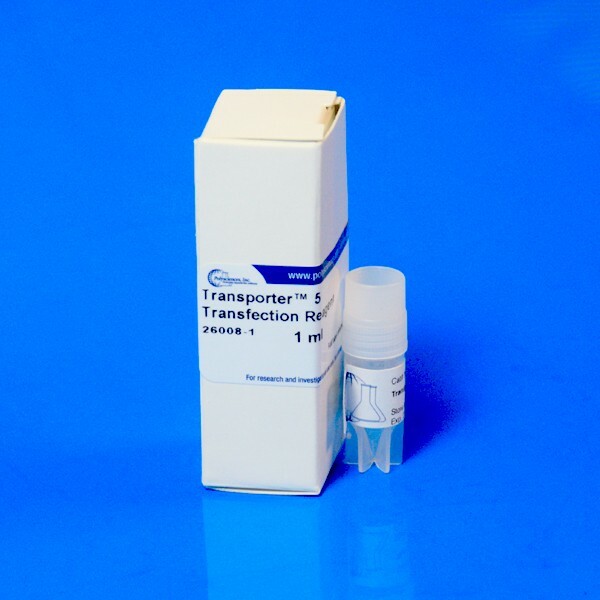 We developed our own scientifically-sound, quantitative performance assay for Transporter 5™. Most commercial performance assays are based on qualitative assays like SEAP and GFP. These assays cannot ensure the high titers most scientists require. The few reagents that are tested quantitatively typically use undisclosed HDAC inhibitors to improve results. Transporter 5™ is required to produce high titers without any supplementation. Even after initial quality control, we continuously monitor performance to ensure each batch is as good as when it was created. Longo, P. A., Kavran, J. M., Kim, M. & Leahy, D. J. Transient Mammalian Cell Transfection wtih Polyethylenimine (PEI). Methods Enzymology 529, 227–240 (2013). doi:10.1016/B978-0-12-418687-3.00018-5. Store at 4 degree C; do not freeze. Shipped at room temperature (RT).